Borough and capital of the county of Bedfordshire, England; situated on the River Ouse. The earliest notice of Jews at Bedford is entered on the pipe-rolls of 31 Henry I. 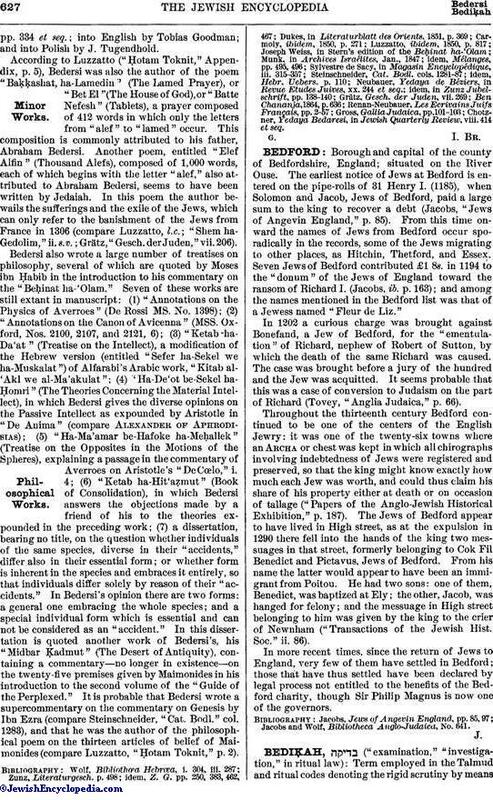 (1185), when Solomon and Jacob, Jews of Bedford, paid a large sum to the king to recover a debt (Jacobs, "Jews of Angevin England," p. 85). From this time onward the names of Jews from Bedford occur sporadically in the records, some of the Jews migrating to other places, as Hitchin, Thetford, and Essex. Seven Jews of Bedford contributed £1 8s. in 1194 to the "donum" of the Jews of England toward the ransom of Richard I. (Jacobs, ib. p. 163); and among the names mentioned in the Bedford list was that of a Jewess named "Fleur de Liz." In 1202 a curious charge was brought against Bonefand, a Jew of Bedford, for the "ementulation" of Richard, nephew of Robert of Sutton, by which the death of the same Richard was caused. The case was brought before a jury of the hundred and the Jew was acquitted. It seems probable that this was a case of conversion to Judaism on the part of Richard (Tovey, "Anglia Judaica," p. 66). Throughout the thirteenth century Bedford continued to be one of the centers of the English Jewry: it was one of the twenty-six towns where an Archa or chest was kept in which all chirographs involving indebtedness of Jews were registered and preserved, so that the king might know exactly how much each Jew was worth, and could thus claim his share of his property either at death or on occasion of tallage ("Papers of the Anglo-Jewish Historical Exhibition," p. 187). The Jews of Bedford appear to have lived in High street, as at the expulsion in 1290 there fell into the hands of the king two messuages in that street, formerly belonging to Cok Fil Benedict and Pictavus, Jews of Bedford. From his name the latter would appear to have been an immigrant from Poitou. He had two sons: one of them, Benedict, was baptized at Ely; the other, Jacob, was hanged for felony; and the messuage in High street belonging to him was given by the king to the crier of Newnham ("Transactions of the Jewish Hist. Soc." ii. 86). In more recent times, since the return of Jews to England, very few of them have settled in Bedford; those that have thus settled have been declared by legal process not entitled to the benefits of the Bedford charity, though Sir Philip Magnus is now one of the governors. Jacobs and Wolf, Bibliotheca Anglo-Judaica, No. 641.